National Debt Holdings is proud to announce that the company has earned Certified Professional Receivables Company (CPRC) status with the Receivables Management Association (RMA). This new certification demonstrates the commitment that National Debt Holdings has made to compliance and professionalism. “We are proud to be joining the ranks of the best companies in the entire industry” said President Jeremy Poehler. “Certification with RMA has become one of the criteria that debt sellers use when deciding who to sell their accounts to. Since we were already operating our business under guidelines far stricter than the certification program, it just made sense for us to participate and get certified” he continued. Company certifications are granted to companies that comply with uniform and rigorous industry standards of best practices and pass a company background check. All standards meet federal and state statutory requirements and many exceed these requirements or create standards where none existed. Certified companies are subject to a variety of audits to ensure they continually comply with the requirements of the certification program. All certified companies are subject to a full compliance audit every 3 years and additional limited compliance audits as directed by the certification counsel. “Earning certified status with Receivables Management Association opens new doors for account acquisitions. The certification program is something that helps us to standout from our competition and we look forward to networking with other certified companies to continue to learn how we can improve across all areas of our business” said Vice President of Sales & Purchasing, Christian Brzostowicz. Receivables Management Association International (RMA) is the nonprofit trade association that represents the interests of more than 550 companies that support the purchase, sale, and collection of performing and nonperforming receivables on the secondary market. 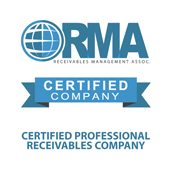 RMA’s Receivables Management Certification Program (RMCP) sets the global standard within the receivables industry by providing enhanced operational controls and consumer protections through rigorous and uniform industry standards of best practice. Founded in 1997, RMA began certifying companies and individuals in 2013. As of 2017, over 375 certifications have been authorized.